For tiles and tiling in Dartmouth, Kingsbridge, Totnes, Salcombe, Modbury and Ivybridge. At RGC there are more than 800 styles on display in our showroom. Choose from over 800 tiles from Original Style, laura Ashley, RAK Ceramics and BCT in our Inspirations kitchen and bathroom showroom on the first floor. Including mosaics, borders and decor statement tiles. 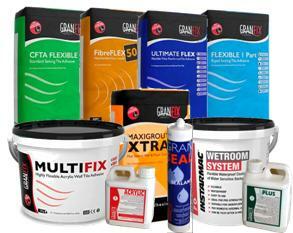 We stock a comprehensive range of Adhesives, Grouts, Sealants and Primers to help you get the perfect finish. 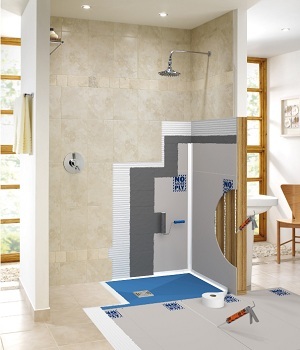 No More Ply is the first tile backing system for bathrooms and kitchens with a Lifetime Guarantee. Our new dedicated kitchen wall tile display has an exquisite selection of wonderful ceramic tiles especially designed to look perfect in any kitchen. There's a range of traditional and modern block and brick designs and some stunning glazing effects to inspire you. The spin-able boards make browsing and comparison a pleasure. 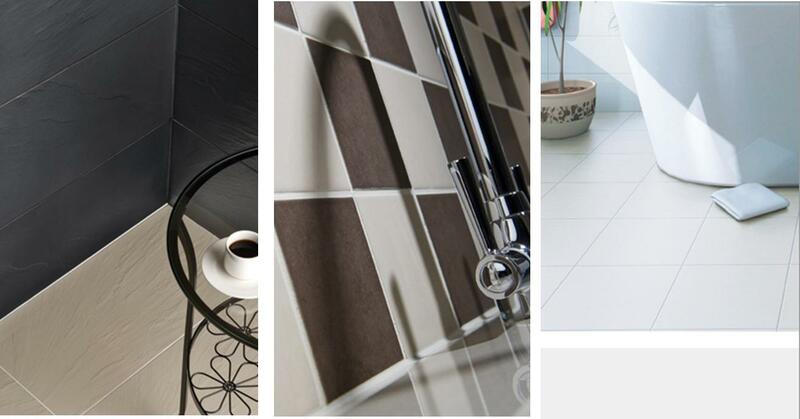 We have a comprehensive range of beautiful floor and wall tiles from the most reliable manufacturers around the world to ensure a perfect finish every time. All our tiles are compatible with electric under floor heating systems. Pop in and browse the extensive ranges or buy on line here. Floor and wall tiles are the ideal material for kitchens, bathrooms and wet rooms as they are resilient and very easy to clean. The kitchen and bathroom areas are some of the most used in the home and, so they need to be resilient and hardwearing. Kitchens also need to be hygienic areas as you will be preparing food in there and as tiles are so easy to keep clean they make for the ideal floor and wall coverings.Tiles come in a range of sizes, styles, materials and finishes and RGC Building Supplies has a large selection on offer to suit any style and budget. So, whether you want decorative tiles for an ornate bathroom or large rustic tiles for a family kitchen, we have the tile to suit the job. Wall and floor tiles are most commonly made from porcelain or ceramic. This is because porcelain and ceramic tiles are hardwearing, making them ideal for use around the home as they do not easily crack under pressure nor does their finish scratch or wear easily. Floor tiles are often fired at hotter temperatures during the manufacturing process to make them stronger to withstand the pressure of being walked on. Floor tiles from RGB Building Supplies are all made to be compatible with under floor heating systems so that you can have a warm bathroom and avoid cold feet in the morning. Wall tiles are ideal for bathrooms and kitchens where the walls are often subject to splashes of food and water. In areas where the walls are likely to get wet, tiling is the most sensible wall covering to prevent damp and damage to paint and plaster. Wall tiles come in a range of styles and sizes. Smaller tiles make great intricate patterns and create a coloured splashback. Larger tiles can have patterns on them so that you don’t have to have plain walls just because of your tiling. If you want to lay tiles in your bathroom or kitchen, you can employ a tiler to do it for you or you can do it yourself. Tiling may sound easy, but ensuring that each tile is laid straight and even can be a tricky and time-consuming task. You will need to invest in tiling cement, grout and spacers as well as your chosen tiles before you begin. You should start by using a tiling trowel to spread enough cement on the wall for just your first layer of tiles. Lay your first tile and use spacers to measure the distance between this tile, and the next you will lay. When you have laid your first row, use spacers to ensure the next row is the same distance above and then apply more cement to the wall for the next row. Continue this way until you reach the top of your wall. When all your tiles are laid you should leave them for 24hours before removing the spacers. Then you will need to grout in between the tiles and leave to dry again before scraping off any excess. Tiling may take a while but as long as you have all the supplies you need from RGC Building Supplies, allowing you to lay your own floor or wall tiles with no problems.